Sharks are the most commonly feared ocean creatures and are the reason behind many beautiful beaches being closed with thousands of swimmers refusing to leave the safety of the shoreline. Perhaps the most fearsome extreme sport, Shark Cage Diving takes you into the territory of the world’s scariest predator, giving you the adrenaline rush of a lifetime. Shark Cage Diving is one of the Cape’s most popular extreme tourist activities. Shark Cage diving in Cape Town allows you to come up close and personal with these formidable creatures, whilst safely being out of the reach of their infamous jaws. There are many reasons why sharks are feared. Their teeth and what some think evil looking eyes are perhaps at the forefront of our minds. Images from famous films of fins slicing through the water and scary music accompanying sharks have most of us cowering at the thought of them. Endless photography and video recordings of sharks moving quickly and brutally catching their prey work in our imaginations, and stories reported and passed around have told us that these creatures won’t stop at anything if they are hungry. The fear and panic sharks create in us makes the latest and possibly the most terrifying extreme activity Shark Cage Diving so compelling. Cape Town has a healthy and growing Great White shark population due to their protection and conservation. With a huge seal population in and around False Bay and Gansbaai, sharks enjoy the Cape for breeding and feeding. Speculation surrounds Shark Cage Diving in Cape Town as its impact on the shark and seal population is unknown. The most controversial speculation however is whether shark cage diving associates humans with food, making it likely that sharks will hunt humans in the future. This has been researched since the beginning of the industry 15 years ago and nothing to date has drawn a connection between the two. Although it is important to consider the impacts on the environment, sharks and people are not directly harmed by shark cage diving. Cape Town is home to many Shark Cage Diving businesses and invites visitors to have the once in a lifetime opportunity to encounter the terrifying Great White Shark and to learn more about them. The trip will hopefully dispel the myths behind this beautiful predator and teach people that sharks are not mindless killers but incredibly intelligent and advanced predators. The most popular regions in the Cape for Shark Cage Diving include Gansbaai and False Bay. False Bay has been the focus of many documentaries due to the natural hunting activity that occurs around Seal Island. 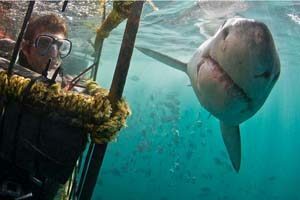 -(nonsense), and Gansbaai is known as the Capital of Great White Shark Cage diving in the world. Great White Sharks have been known to grow up to an astounding 6 meters in length. Shark Cage diving calls all adrenaline junkies, tourists, and animal lovers to witness Great White Sharks in their own territory. Whether you are facing a life-long fear, are in it for the adrenaline rush created by being up close and personal with the world’s most famous sea predator, or are simply curious about these terrifying yet majestic creatures, Shark Cage Diving in Cape Town is an experience that you’ll never forget.